Welcome to Skagit River Guide Service. 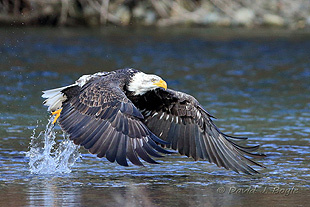 Join Pro Guide Wayne Ackerlund for Bald Eagle Scenic Tours, Guided Photography Trips, as well as professionally guided gear-fishing or fly fishing trips for Salmon, Trout and Steelhead. We offer Washington Steelhead Guide, Washington Salmon Guide as well as Dolly Varden and Cutthroat trout fishing on the Skagit and Sauk rivers. We also offer trophy steelhead and salmon trips on the premier rivers of Washington's Olympic Peninsula; Bogachiel, Hoh, Sol-Duc and Quillayute Rivers. If you are looking for a Washington Steelhead Guide, Washington Salmon Guide for the Columbia river system we offer trips as well. 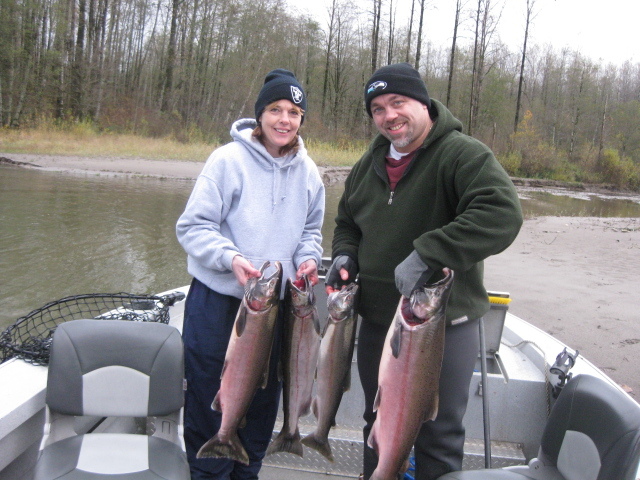 We also do Cowlitz Steelhead Guides, Cowlitz River Salmon Guides and Lewis river Salmon Guides. View our Best Fishing Times page for more info on our fishing schedule and other river systems we fish. Catch that Trophy of a lifetime! Welcome to Skagit River Guide Service. Based out of Mount Vernon Washington, we are a full time Washington Fishing Guide service offering World Class sport fishing trips for Salmon, Trout and Steelhead on many of Washington's Premier rivers. If you are looking for a Skagit Fishing Guide, or are interested in fishing other renowned rivers in the Pacific Northwest, we have the knowledge and equipment to ensure you have an exciting and successful experience. We have been guiding different rivers in Washington since 1996 and are dedicated to providing an exceptional to our clientele. Primarily we use a 22 foot Fish-Rite jet sled or our 20 foot Koffler drift-boat, which provides comfort and an excellent fishing platform. For smaller rivers or fly fishing trips we use a 17 foot Hyde, with dual fly stands. All of our Boats are heated for your comfort, as well as providing top of the line equipment to ensure your best chance of success while on the water. Whether it's fly fishing for native Steelhead on the Skagit, in search of trophy Chinook Salmon on one of the Olympic Peninsula's premier rivers, Lewis River Spring Chinook or Cowlits river steelhead trips our knowledge and experience will put you in the right place at the right time. Come and join us to fish the Skagit River for Trophy Steelhead and Skagit River Salmon. Many of our clients insist that we are The Best Skagit River Salmon Guide in Washington. 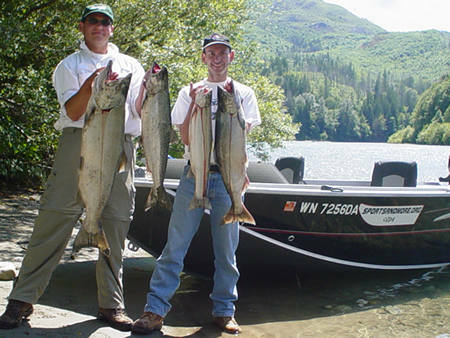 Washington Fishing Guide Service offering Guided Steelhead and Salmon Trips on many Washington Rivers. Washington State offers some of the finest Salmon and Steelhead Fishing in the World. 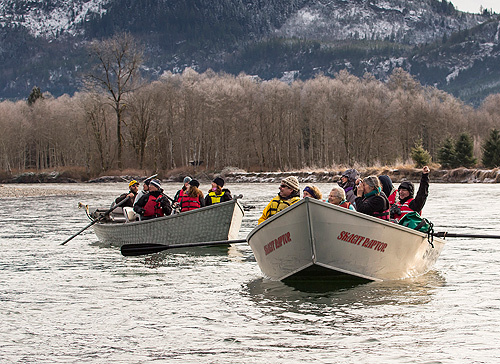 Let Skagit River Guide Service take you on a trip of a lifetime. Beautiful scenery is abundant in the Great Northwest from the Bald Eagles on the Skagit and Sauk, to the breathless mountain scenes on nearly all the rivers. 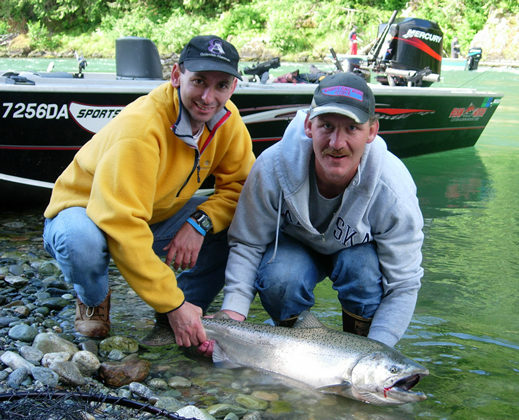 Skagit River Guide Service will work hard to ensure that your fishing trip is memorable one. Salmon, Steelhead or Trout, we want you to catch that fish that will keep you talking about it for years. Give me a call or send us an e-mail and let's set up that guided trip that you've been dreaming about. 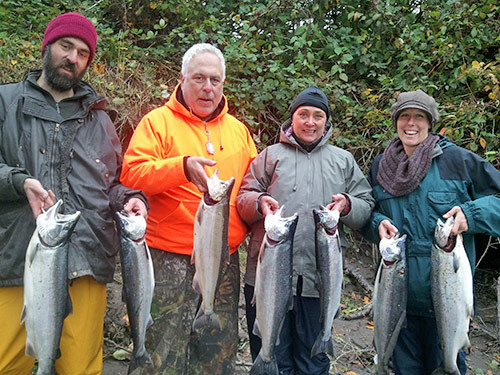 Skagit River Guide Service is a fully licensed and insured Washington guide service, dedicated to providing comfort, professional service and satisfaction to our clientele. Feel free to browse our sight for more info, and keep an eye on us, we have many additions coming to this site soon!